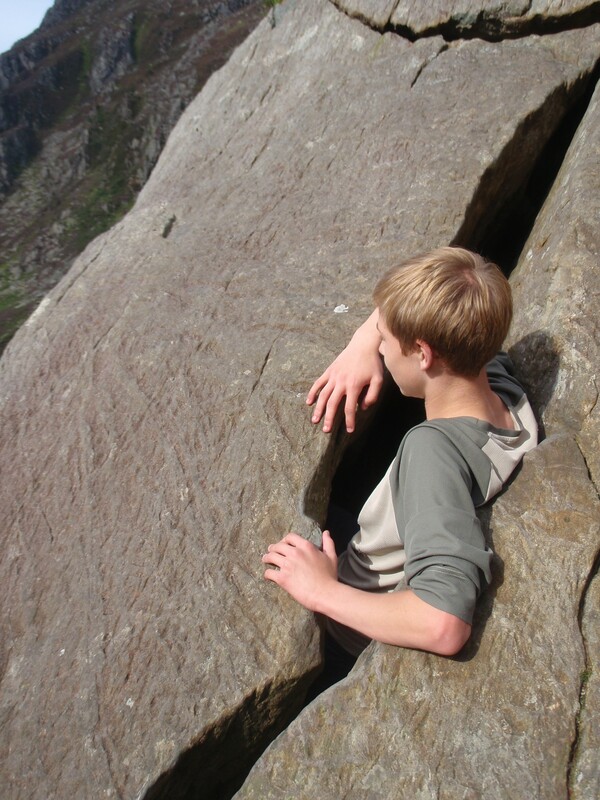 Isaac having fun completing the Idwal Squeeze (V1), bouldering at Idwal Cottage Crag, Ogwen Valley. ‘Awesome, wicked, a nightmare, squashed and squeezed – thanks for the encouragement Joe. 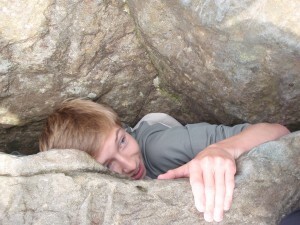 I loved it after I got over the fear of getting stuck in there!’ Isaac. Nearly there – it is a bit tight in here! One more push should do it. Sorted – that was brilliant. ‘Hi Joe, we just wanted to say thanks very much we had a great time learning to navigate. We learnt such a lot under your friendly guidance, as well as giving us a fun experience. Thanks for the helpful advice so that we can continue to improve. We had not been in the Ogwen Valley before, so navigating in such stunning scenery was a real bonus. 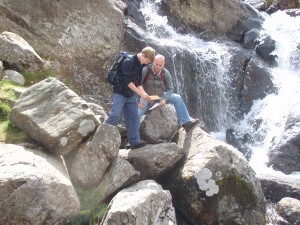 We look forward to coming back to North Wales for lots more walking and practising our navigation skills.’ Steve and Isaac. Our Introduction to Hill Skills and Navigation is ideal for beginners or those with some experience wishing to build their confidence. 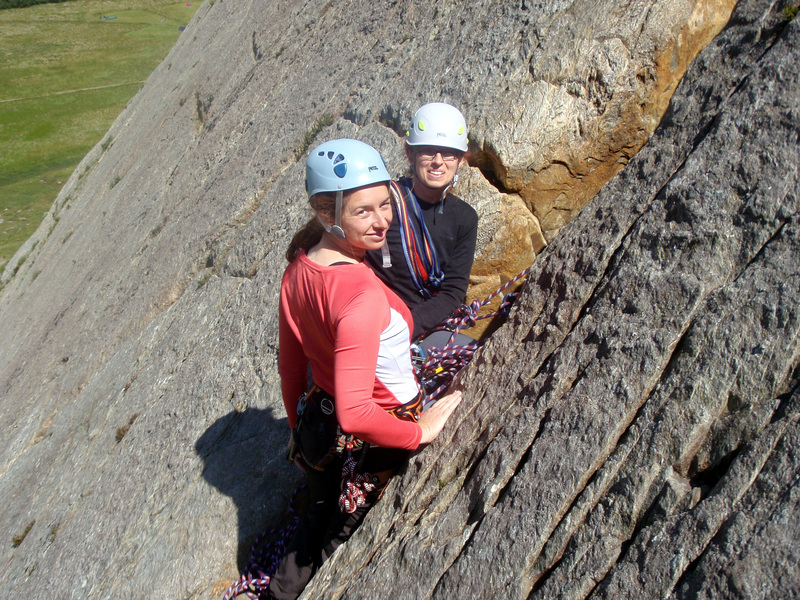 Sandra and I were climbing in the Llanberis Pass recently and observed a climber getting into difficulty. The ‘call’ the second climber was making to the lead climber was unclear. As a result the ‘call’ was misinterpreted by the leader. The leader interpreted this as ‘slack.’ That is what the lead climber heard with the direction of the wind and the distance between the two climbers. The lead climber duly let out more rope. This happened twice and by now the second climber had a loop of rope below him. He started to look uncomfortable on his stance. Sandra (who could see the climber below her) called up to me, to shout instructions to the lead climber to ‘take in’ the rope, which he did and their climb continued without incident. Of course, it could have been a different story. Remember, climbing calls should be clear and unambiguous. Take In’ This is the call from the climber when they require rope taking in. ‘Slack’ This is the call a climber makes when they require more rope. DO NOT put the two ‘calls’ together in the same sentence. ‘Climb when ready’ The belayer is letting their partner know that they have them on belay, they are ready to protect them and they can start climbing. ‘Climbing’ The climber is letting the belayer know that they are ready to start climbing. ‘OK’ The belayer acknowledges the climbers call. ‘Safe’The leader is informing the second that they are secured to a belay and that they can be taken off the belay device. ‘Off Belay’ The second is telling the lead climber that they have been taken off the belay device. ‘Taking In’ The leader is letting the second know that they are taking in (pulling in) all of the slack rope between them. ‘That’s Me’ The second is informing the leader that the rope is now tight and the lead climber has now pulled all of the rope in between them. ‘Rope Below’ A climber will give this warning call when they are about to throw a rope down the rock face. Spectacular short sea-cliff routes, secluded coves, turquoise seas and sunshine. What more could you want on your day off? 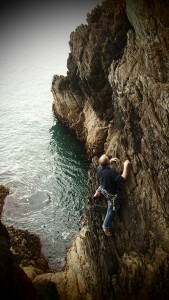 Joe traversing the rocky cliffs at Rhoscolyn, Holy Island, Anglesey. 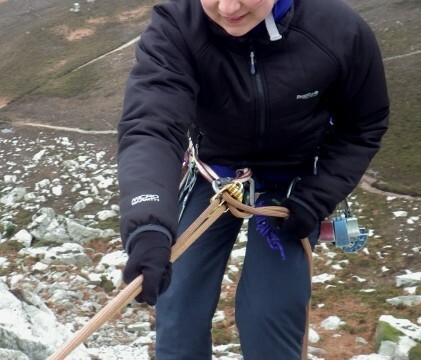 Paddy thoroughly enjoyed his 3 days learning to lead climb and sent Mountaineering Joe an account of his experience. “on the first day we climbed diffs and V.diffs and concentrated on the principles and techniques of setting up belays. For example, always maintaining a loaded system, to avoid the dangers of shock loading. On day 2, in the morning, Joe had me climb the same level and even a mod making me place gear in every possible placement, until I emptied a full rack. 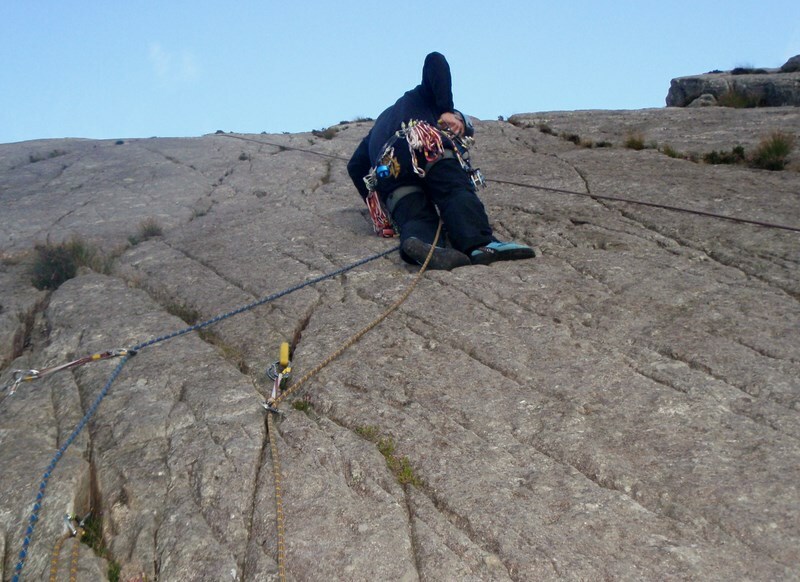 In the afternoon, we tackled a delicate severe on Tryfan Bach which after balking at a few times I finally took on and won. By this stage I had got it. I was seeing anchor points and picking gear quickly and placing it securely. Throughout his patience was extreme and his encouragement was quiet and unpatronising. I had worked out on day 1 that I had set him an impossible challenge but I was extremely pleased with myself after leading the severe. 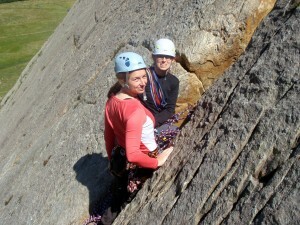 I had achieved what I wanted to achieve which was to learn how to lead a climb safely and confidently. I was confident in my gear placements and in my belays. I understood how it all worked. On day 3 refusing to balk at the challenge Joe took me to lead a VS. Joe can teach you to climb. he keeps it simple and bullet proof. He can teach you to find good placements for safety and how to recognise unsafe ones. He wont allow any mistake to creep in. Every screw-gate must always be closed etc. But, he cant teach you courage! We are glad you had a great experience Paddy. Keep enjoying the climbing and we look forward to climbing with you again. Paddy Wilmot developed his skills in contour map reading and found his enjoyment of the mountains was greatly enhanced. 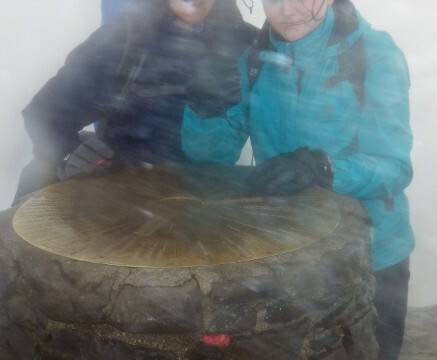 “I had done a fair bit of micro navigation and general navigation whilst undertaking Mountain Leader training. This involved calculating routes from a-b using compass bearings, timings and pacings, and a storyboard based on map features like walls, boundaries, cairns or sheepfolds etc. This method of navigating has such a complex story board that it requires constant referring to the map and compass and complex pacings and timings, not conducive to a comfortable walk in the hills and an interesting conversation with your companions. I wanted to be able to navigate with my map and compass, for the most part, zipped inside my pocket. I mentioned to Joe that I wanted to be able to stow my map a bit more. He said I needed to learn contour navigating, using the contours to ‘see’ the shape of the land and even using the fall line as a compass. We went off to a bowl, under Moel Hebog, to find a ruined cottage using only the contours to find it and then using only the contours to ‘prove’ that it was there. I suddenly got it. From then on we navigated to find little irregularities in the contours. For each leg we analysed the shape of the land as the storyboard and put the map away before setting off, only pulling out the map again when we had decided that the destination, the small flattening say, had been reached. In due course Joe said, “put your compass away, use the contours to orient your map”. Well done Paddy, we’re pleased you found that map reading can be fun. The team at Mountaineering Joe wish you every success with your Mountain Leader qualification. 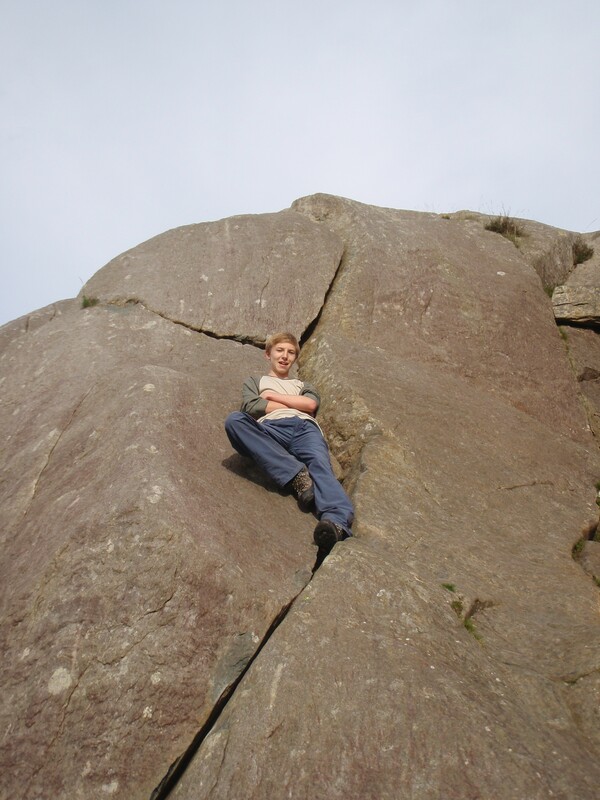 “My first attempt at rock climbing was last year in the Snowdonia mountains at Tryfan Bach, with Joe leading our small group. It took some encouragement by the other group members to persuade me, initially, to have a go at the climb. Joe was very reassuring about it, telling me it was an excellent rock face to attempt a first climb. There were a few other small groups climbing however no-one else had an instructor with them. Joe explained the safety equipment and signals and then we were off. He talked to me throughout the climb offering me advice when I seemed unsure and making me feel confident to the point that I abseiled down with a big grin on my face. 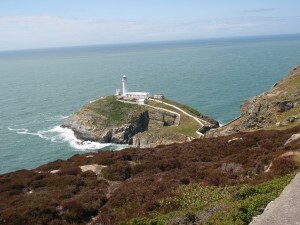 The inspiring and epic 870 mile Wales Coast Path was officially opened to the public on 5th May 2012. 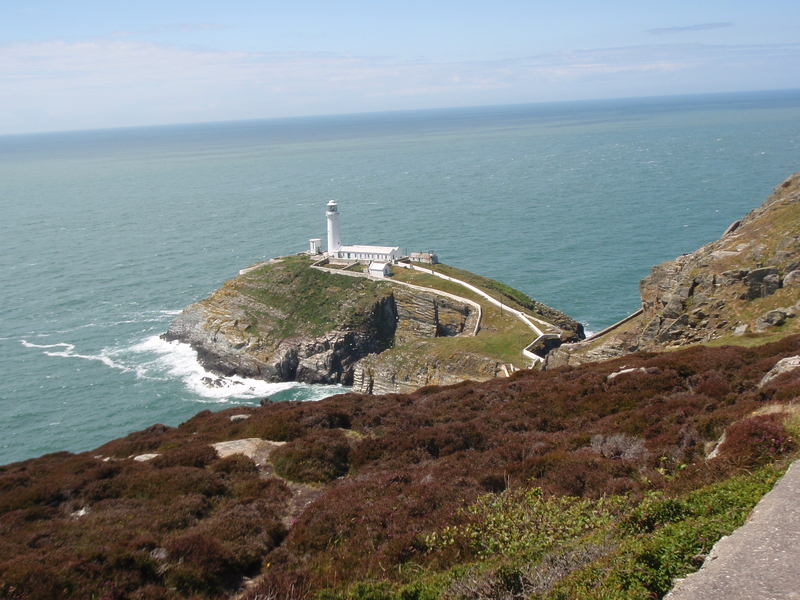 The coast path takes you on a glorious journey from Anglesey and North Wales to the South Wales Coast and Severn Estuary, crossing eight regions. It is more than a walk, it’s a journey through the rich history, culture and heritage of Wales. The Mountaineering Joe team are based in North Wales, at the heart of the Anglesey (Ynys Môn), Menai, Llyn, Meirionydd. 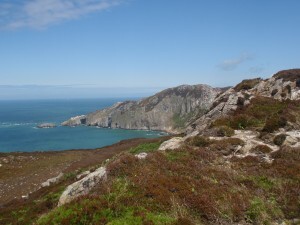 The North Wales sections of the coast path are within easy reach for us. 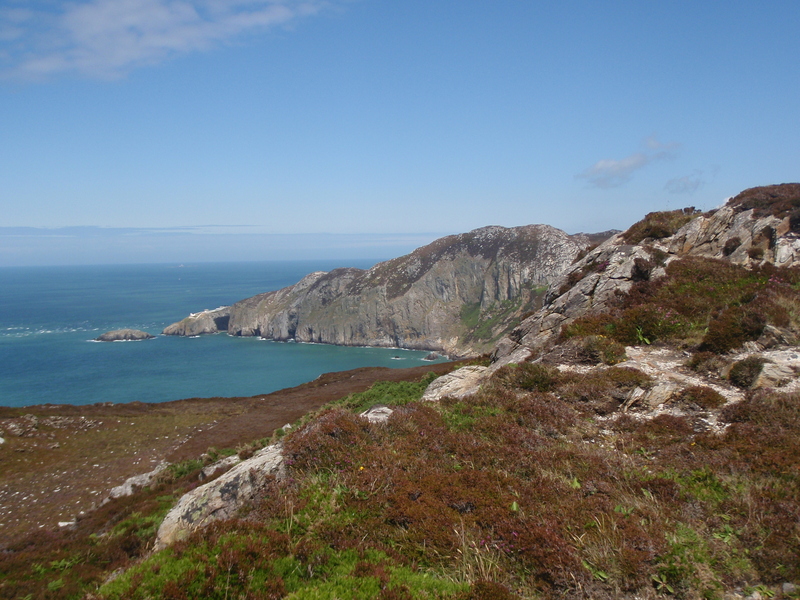 We arrange walks that take our clients through this stunning scenery, so they can enjoy the spectacular beaches, breath-taking sea views and awe-inspiring cliffs.